The start of the Thorney 10K. 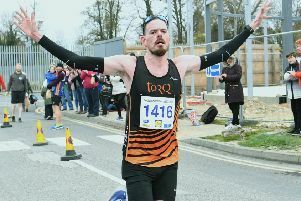 Peterborough Athletic Club’s Steve Robinson won the Thorney 10k on Sunday, dominating the race from gun to tape. The high-flying RAF Corporal ran the perfect race on a near perfect day for the event, winning by nearly a full minute in a time of 33:17. Callum Stanforth of King’s Lynn outfit Ryston Runners took second place in 34:11, and was joined on the podium by third-placed Ben Heron of Eye Community Runners, who finished just five seconds further back. Peterborough AC took the men’s team prize with Robinson receiving sterling support from Steve Hall in 10th place and James Sadlier, who came home 14th. Bushfield Joggers’ British Masters Marathon and Half Marathon gold medallist Phil Martin ran steadily to finish seventh on his comeback from injury. Natalie Laurence of Fairlands Valley Spartans was comfortably first lady home with a time of 39:03. She was followed by Ramsey’s Lisa Marriott. who clocked 39:40. Nene Valley’s Emma Penniston was third, two minutes further back, just pipping Geraldine Larham of March AC. Nene Valley carried off the ladies team prize with Penniston backed well by veterans Ruth Jones and Yvonne Scarrott. There were plenty of locals among the age group winners with golden oldies Eric Winstone and Terry Fone claiming the male Over 60 and Over 70 prizes respectively. Steve Hall won the Over 45 category while Michael Stacey of March AC took the men’s Over 55 prize. For the ladies Nene Valley’s Ruth Jones was the first Over 35 and Eve Casbard of Bushfield Joggers was the first Over 40. Elizabeth Whittaker was another prize-winning Bushfield Jogger as first Over 55, and Geraldine Larham, Barbara Johnson of Yaxley and Eye’s Sue Ridley were Over 45, 60 and 65 winners respectively. The girls shone in the junior 3k race with Chloe Loosely from BRJ Huntingdon first in 12:24, two seconds ahead of Dom Pauley. Yaxley youngster Amelia Devine was third.